Bubbles are given off by the plant through Photosynthesis. By measuring the rate at which the bubbles are produced it is possible to tell how fast the plant is photosyntheising (measuring amount of oxygen bubbles produced per minute). Plants need energy to carry out important life processes like growing. Unlike animals, they do not hunt for food or eat. Instead, plants make their own food through a process called Photosynthesis. 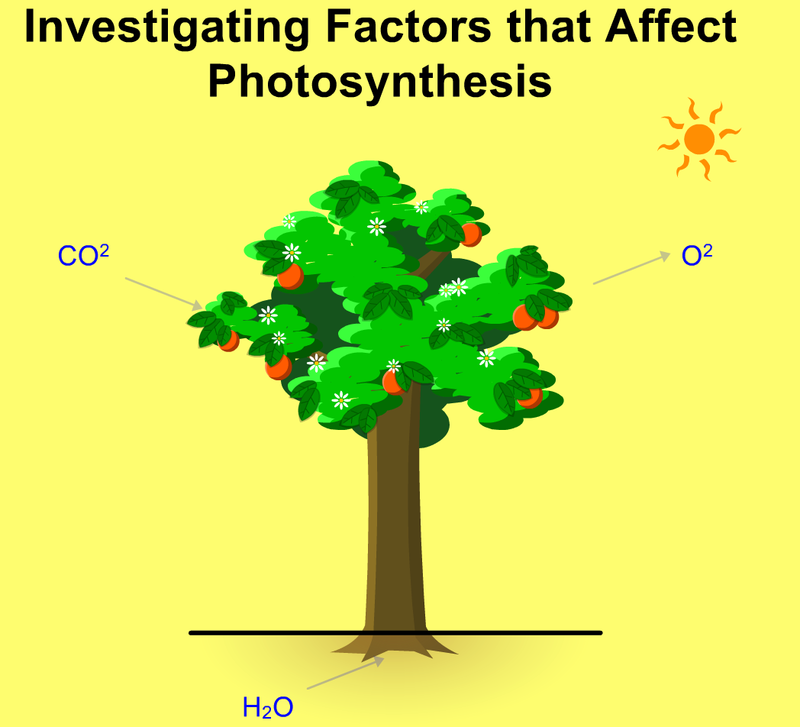 Photosynthesis takes place in the leaves of the plant. To make food by photosynthesis, plants need water and carbon dioxide as raw materials to make food. Plants also need chlorophyll to trap light energy. the light energy is then used to combine water and carbon dioxide to produce sugar. Oxygen is also released during photosynthesis. Light energy is absorbed by chlorophyll and converted to chemical energy. 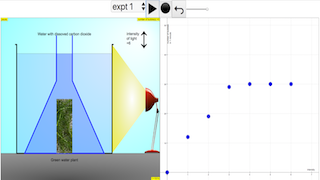 Move the slider for Light Intensity to the first unit. Observe what happens to the plant and answer the questions below. What do you observe at the plant? What is the gas that is given out? What does the amount of gas given out tell you about the rate of photosynthesis for plant? What is the variable in this experiment? Press Play Experiment and let the experiment run for 1 minute on the stopwatch on the bottom right corner. After 1 minute, the total number of bubbles given out by the plant will be shown on the box marked Number of Bubbles on the top right corner of the simulation..
Click Record to store the data of the Number of Bubbles given out by the plant in 1 minute in the table on the right panel. Repeat this experiment for units 2 to 6.
suggested sample data is provided below, please remove it before giving it to the students. Click on Graph option of the dropdown menu. The values that you have recorded using the simulation will be automatically plotted, which is the graph of Number of Bubbles against Light Intensity. Print out the graph that you have plotted and paste it in the space below. Describe the graph between 0 and 4 units of light intensity. What does this tell you about the relationship between light intensity and the rate of photosynthesis between 0 and 4 units of light intensity? What does this tell you about the relationship between light intensity and the rate of photosynthesis when the light intensity is more than 4 units? It is usually difficult to get accurate readings when this experiment is carried out in a school laboratory. Give one reason why this is so. Suggest one way to overcome the difficulty that you have stated above. Select Expt 2 on the option on top of the simulation view. Move the vertical slider for percentage of carbon dioxide dissolved in the water to 0.05%. Click on Play button to start the virtual experiment. Press play button to start the Experiment and let the experiment run for 1 minute on the display on the bottom right corner. After 1 minute, the total number of bubbles given out by the plant will be shown on the box on the top right corner marked Number of Bubbles which appears on the top of the plant. Click on store data to record the Number of Bubbles given out by the plant in 1 minute in the table on the next page. Repeat this experiment for 0.1%, 0.15%, 0.2%, 0.25% and 0.3% of carbon dioxide dissolved in water. Click on option on the top dropdown menu to Graph2. With the values that you have recorded in the virtual simulator, the plot the graph of Number of Bubbles against Light Intensity as plotted automatically for you. Print screen the Graph2 that you have plotted and paste it into the space below. Describe the graph between 0% and 0.15% of carbon dioxide. Between 0% and 0.15% of carbon dioxide, what can you tell about the relationship between carbon dioxide concentration and rate of photosynthesis? Describe what happens to the graph after 0.15% carbon dioxide. What does this tell you about the relationship between the carbon dioxide concentration and rate of photosynthesis when carbon dioxide concentration exceeds 0.15%?